More than two-thirds of the world's polar bears will be killed off by 2050 - including the entire population in Alaska - because of thinning sea ice from global warming in the Arctic, government scientists forecast Friday. The agency projects that polar bears during that time will lose 42 percent of the Arctic range they need to live in during summer in the Polar Basin when they hunt and breed. 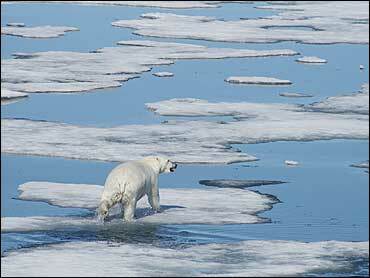 Polar bears depend on sea ice as a platform for hunting seals, their primary food. But the sea ice is decreasing due to climate change. "It's that declining sea ice that appears to be driving the results in our models," said U.S. Geological Survey scientist Steven Amstrup, the lead author of the new studies. "As the sea ice goes, so goes the polar bear." "Despite any mitigation of greenhouse gases, we are going to see the same amount of energy in the system the next 20, 30 or 40 years," Mark Myers, the USGS director, said. Greenland and Norway have the most polar bears, while a quarter of them live mainly in Alaska and travel to Canada and Russia. But the USGS says their range will shrink to no longer include Alaska and other southern regions. A separate organization, the World Conservation Union, based in Gland, Switzerland, has estimated the polar bear population in the Arctic is about 20,000 to 25,000, put at risk by melting sea ice, pollution, hunting, development and tourism.